Charming House on Waterway in Nettles Island Resort near Beach, Pools & Fun! 3 Bedrooms, 2 Baths, (sleeps 6) with 4 seat golf cart available for rent. To check availability, please use only Saturday check in/check out days from mid December through April. Soothing island colors and comfortable 'beach' decor will welcome you as you enter the cottage. A wall of windows in the family room and kitchen provides a serene view of the waterway and private dock on the quiet East seawall of Nettles Island. It is not uncommon to see dolphins in the morning, many varieties of birds, fish jumping out of the water and occasionally a manatee. The private dock for fishing or leisure time is just a few steps out the back sliding door. You are welcome to use our bikes, beach and fishing equipment and rent the 4 seat golf cart during your visit. On the table you will find House Rules and 'Things To Do' Notebooks with lots of helpful information about the house, Nettles Island Resort and the surrounding communities. Nearby are numerous activities and services available when you are ready to explore the Nettles Island community: 2 pools, hot tubs, beach and Beach Club, Marina, Clubhouse/ Recreation Center including sports facilities, inside and outside games, Gym, Stores, Restaurants, etc... all within walking distance. Nettles Island is a resort community encompassing a 24-hour security gated neighborhood development between the saltwater Indian River Lagoon and the Atlantic ocean and located between the Ft. Pierce inlet to the north and the St. Lucie inlet to the south. The private and unspoiled beach and Nettles Island Beach Club heated pool, snack bar and restrooms with showers is 4 blocks away. Walking, bike riding and golf carts are the most common forms of transportation in the community. You are welcome to rent our 4 seat golf cart for $125/week or $300/month. Bring your boat to explore the lagoon, spoil islands and inlets. You are welcome to tie up to the dock which is equipped to accommodate a 24 ft. boat. The boat lift is unavailable. You can walk or jog for miles and miles along the gently sloping wide beach seeing very few people or bring a flashlight to the beach at night in the summer months and often observe the giant sea turtles come ashore to dig a nest in the sand and lay their eggs...but no touching allowed by law. The Neighborhood: In the commercial center you will find a marina, beachwear shop, restaurant and best of all, The Village Grocer. There you will find groceries, baked goods, sandwiches, beer, wine, bait, rent fishing gear, rent movies, buy souvenirs or just have a nice chat with the locals. At the other end of the development along the waterway, you will find the activity clubhouse (Rec Center) and lots to do: tennis, horseshoes, mini golf, shuffleboard, boccie ball, basketball, tot playground, larger heated pool with 2 hot tubs, kiddie pool and restaurant open for breakfast and lunch, workout room, pool & ping pong tables, arcade games, computers with internet and more. The kitchen has all the major appliances and is fully stocked for cooking and dining. The adjoining family room has a 37' flat screen TV with a DVD player. The larger bedroom (sea glass room) includes a comfortable queen bed, a small bathroom with a nice size shower, and a 32' flat screen TV. The second bedroom (mermaid room) also has a queen bed. The third bedroom (sea turtle room) has 2 twin beds. All bedrooms have closets and dressers. All rooms have ceiling fans and central A/C and heat. The Dock: Walk a few steps out the back door to get a closer look at the boats slowly motoring by or cast a line and catch fresh fish for dinner. The dock has a built in bench along with portable table and chairs which make it a great place to fish, eat, read and relax while taking in the view. In the cooler months, open up the sliding door to enjoy the refreshing ocean breeze throughout the house. Upon check in please review the Guest Notebook. The house will be stocked with approximately 2 days worth of necessities: toilet paper, tissues, soaps, shampoo for the bathrooms and dish soap, dishwasher soap, paper towels, trash bags and coffee in the kitchen. Stop in to the Village Grocer down the street or Publix supermarket to purchase food and necessities for the duration of your stay. All bed linens, towels (including beach towels) and kitchen towels are provided. Please be aware that the seawall is very close to the back door. It is recommended that all renters, especially children, be able to swim. You will find a ladder and life ring on the dock, but these items may not be enough to prevent a drowning due to accidental fall ins. Since we are close to the seawall, the cottage is up 4' feet; therefore, upon entering there are 8 steps up to the living area. We know you will enjoy your stay. It is a wonderful place. We have lived in south Florida since 1987 and purchased the property and built the cottage to use for our family fun in the summers near the beach. Since our 3 daughters are 'all grown up' we are happy to share the use of the house for others to enjoy. Nettles Island is the place for creating happy memories! We love the beautiful uncrowded and unspoiled beach as well as all the Nettles Island Resort has to offer. The view and private dock on the waterway is very special. In the evenings we enjoy sitting on the dock bench with a glass of wine, sharing the day's events and watching the moon rise over the water with the sound of the ocean nearby. Master bath has a large tiled shower and pedistal sink with cabinet and shelving over the toilet. The hall bathroom has a sink/cabinet with ample counter space and shower. There are no bathtubs in the bathrooms. Beach Club on the beach includes heated pool, rinse offs, showers, bathrooms and snack bar. Walk, bike or take golf cart 5 or 6 blocks away to the Beach Club directly on the beach. overlooking the Indian River Lagoon which is part of the navigable intercoastal waterway. 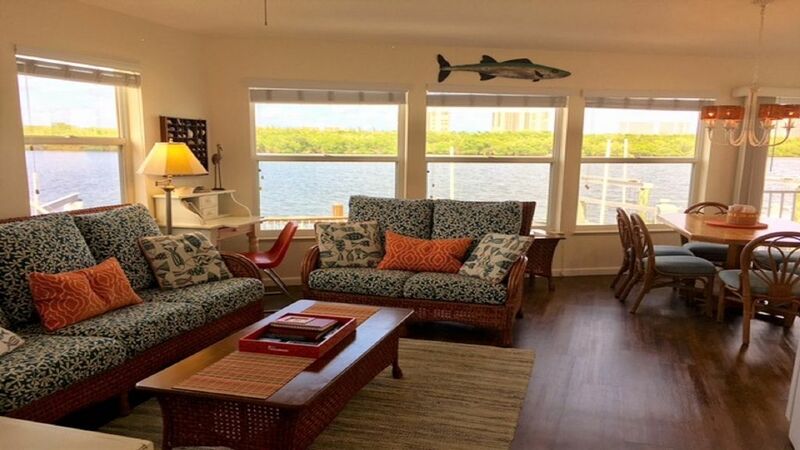 Water view of the Indian River Lagoon is seen from all windows in the family room and kitchen. The cottage is on Indian River (saltwater) Lagoon which is part of the intercostal waterway. 24 hours of household papers and soaps are provided. Renters are expected to supply their own household supplies and food for the remainder of their stay. Plenty of silverware and dishes for 12 people. The kitchen is stocked well even for those who enjoy cooking. Dining table is pedestal style and has room for 6+. Table and chairs on dock can also be used for dining. beach toys and life preservers available along with fishing equipment and tackle box. The house is 4 feet off the ground so once you enter through the front door you will find 8 steps leading up to the living areas of the house which are all on the same level. The seawall is very close to the back sliding door thus probably not suitable for very young children or non swimmers. This house had everything we needed and more! Thanks for an enjoyable stay! What a great place for family fun! Fishing off the dock and putt putt course made it perfect for entertaining kids. Property was clean with everything for fun in the sun. Charming cottage with "island feel"
Absolutely charming cottage on Nettles Island, cute decor, all the amenities and then some. Steps out the back sliding doors, we would run down to the dock and throw out a line. The little island feels very intimate and safe; took several walks between showers during a rainy week. WiFi worked great. We did not need 3 bedrooms but they were all super cute. Beds slept very well. House has everything you need for an awesome vacation!!! 5 stars!!! We had a great time. The house and community have everything you need in golf cart distance. We had a nice time at the pool, playing putt putt, going out to dinner all within the neighborhood. The dock is a special place to observe Bird and Fish action. The house itself is clean neat and he has all the extras and necessities. My husband and I love the bikes and the golf cart was lots of fun! This is our third stay and we totally enjoyed it once again. Thank you Warren's! The house is located in Nettles Island Resort which is on a barrier island named south Hutchinson Island in St. Lucie County Florida. The historic seaside towns of Jensen Beach, Stuart and Fort Pierce are easily accessed by short scenic drives. These quaint downtown areas provide casual shops, local restaurants, theaters, green markets and festivals. Every Thursday night Jensen Beach has a fun street festival with live music, special exhibits from local artists and shop owners. It is a very family friendly event and well attended by local residents and tourists. The local theature (Barn Theature) is 7 miles to the south which showcases good local talent well know for their entertaining comedy plays. A few miles west on Ocean Drive you will find historic Stuart, another quaint historic town along the intercoastal waterway a little larger than Jensen Beach with a wide variety of locally owned shops, restuarants and the Lyric Theature know for bringing in 'big name' entertainment. Travel north 11 miles north on Ocean Drive to another historic town of Ft Pierce which has a larger variety of museums, shops, restaurants, Sunrise Theature and state parks. Golf Cart Rental Fee: $125/week $300/month Saturday check-in and check-out days are required December - April Weekend day (Friday, Saturday, Sunday) check in and check out dates preferred for Summer & Fall reservations Reservations are not accepted more than 9 months before check in dates.